Session Fees: Sliding Scale available. Heidi is a member of the Canadian Art Therapy Association, and provides services to individuals, groups, and businesses. ​Heidi has been working with youths and families since 2009. Her background in psychology led to a position at Woods Homes as a youth and family counselor. She facilitated mediated sessions for families and youths in crisis. During this time, she witnessed the impact art had for youths with mental health challenges and decided to pursue art therapy. While studying at the Kutenai Art Therapy Institute, Heidi completed practicum hours with domestic violence survivors, incarcerated men, a mental health/ addictions facility, adolescents, the elderly, children, and with Art From the Streets, which was dedicated to providing an artistic safe place for the homeless. 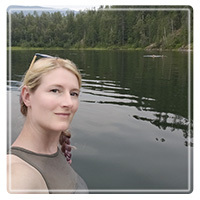 Heidi graduated from the Kutenai Art Therapy Institute in 2015 and published a thesis: Silver Hands: Art Therapy Activities With Survivors of Domestic Violence. This serves as an excellent guide for those running art based groups in women's shelters. ﻿In 2015, Heidi ran three art therapy groups with the Parkland School, based out of Red Deer, Alberta. These groups focused on improving the quality of life for children and adults with developmental disabilities and delays. The art therapy sessions provided sensory stimulation, opportunities for autonomous choice, promoted self mastery, and social connection. Since relocating to Medicine Hat, Heidi has continued her work with developmental delays and disabilities. She also works with adult individuals seeking personal insight and stress management. Heidi also runs a group focused on building inner strengths and self awareness in response to universal and unique parenting challenges. Heidi continues to grow as an Art Therapist working with a variety of different clients.